The caroticocavernous fistula is a specific type of dural arteriovenous fistula characterized by abnormal arteriovenous shunting within the cavernous sinus. The image below depicts a type-D caroticocavernous fistula. 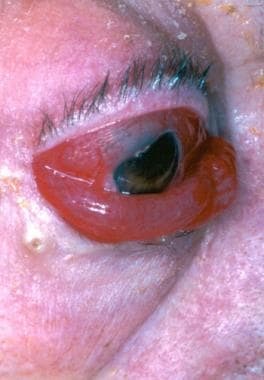 Type-D caroticocavernous fistula: the eye demonstrates proptosis, chemosis, and scleral edema. The patient is unable to close the eye, exposing the cornea to dehydration and potential trauma. A caroticocavernous fistula results in high-pressure arterial blood entering the low-pressure venous cavernous sinus. This interferes with normal venous drainage patterns and compromises blood flow within the cavernous sinus and the orbit, as depicted in the diagram below. This is a diagrammatic representation of the 4 types of caroticocavernous fistulas. ICA is the internal carotid artery; ECA is the external carotid artery. Caroticocavernous fistulas represent approximately 12% of all dural arteriovenous fistulas. Type A is more common in young males. Types B, C, and D are more common in women older than 50 years, with a 7:1 female-to-male ratio. Caroticocavernous fistulas can be caused by trauma. Blunt and penetrating head injuries can result in a caroticocavernous fistula. They also can occur spontaneously. Most caroticocavernous fistulas are of spontaneous origin and unknown etiology. Blunt head injury can lead to shearing of intracavernous arteries, causing the development of a fistula. Penetrating head injury can lead to fistula formation by direct laceration of intracavernous vessels. Spontaneous fistula formation has been associated with (1) ruptured intracavernous aneurysm, (2) fibromuscular dysplasia,  (3) Ehlers-Danlos syndrome and other collagen vascular diseases, (4) atherosclerotic vascular disease, (5) pregnancy, and (6) straining. The onset is usually sudden. Ocular manifestations can include ophthalmic venous hypertension and orbital venous congestion, proptosis, corneal exposure, chemosis, and arterialization of episcleral veins, as shown below. Other ocular manifestations may include diplopia, visual loss, cranial nerve palsy (III, IV, V, VI), central retinal vein occlusion, retinopathy, and glaucoma. Bruit and headache also may be present upon clinical presentation. A caroticocavernous fistula is not a life-threatening disease. The risk of visual loss and the severity of associated symptoms must be evaluated to determine the appropriate degree and timing of intervention. Type-A fistulas rarely resolve spontaneously. Treatment is recommended for intolerable bruit, progressive visual loss, and the cosmetic effects of proptosis. Types B, C, and D fistulas have a higher incidence of spontaneous resolution. The cavernous sinus is a network of venous channels traversed by the intracranial portion of the internal carotid artery. The internal carotid artery gives rise to several intracavernous branches. These are the meningohypophyseal and inferolateral trunks. These vessels branch to provide arterial blood to the nerves and dura of the cavernous sinus and the pituitary gland. The external carotid artery provides several branches to the dura of the cavernous sinus and forms anastomoses with the branches of the internal carotid artery. 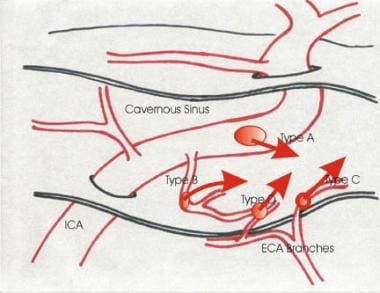 Type A fistulas consist of a direct connection between the intracavernous internal carotid artery and the cavernous sinus. They usually are high-flow and high-pressure fistulas. Type B fistulas consist of a dural shunt between intracavernous branches of the internal carotid artery and the cavernous sinus. Type C fistulas consist of a dural shunt between meningeal branches of the external carotid artery and the cavernous sinus. Type D fistulas are a combination of types B and C, with dural shunts between internal and external carotid artery branches and the cavernous sinus. Types B, C, and D tend to be lower-flow and lower-pressure fistulas with a slower progression of signs and symptoms. No a priori contraindications exist for the management of these lesions. Each patient must be evaluated individually. Generally, the lesions should be managed as aggressively as required to abort the signs and symptoms. Management techniques may be contraindicated if the patient cannot tolerate the possible complications of the treatment. Barrow DL, Spector RH, Braun IF. Classification and treatment of spontaneous carotid-cavernous sinus fistulas. J Neurosurg. 1985 Feb. 62(2):248-56. [Medline]. Karaman E, Isildak H, Haciyev Y, Kaytaz A, Enver O. Carotid-cavernous fistula after functional endoscopic sinus surgery. J Craniofac Surg. 2009 Mar. 20(2):556-8. [Medline]. Hieshima GB, Cahan LD, Mehringer CM. Spontaneous arteriovenous fistulas of cerebral vessels in association with fibromuscular dysplasia. Neurosurgery. 1986 Apr. 18(4):454-8. [Medline]. Bacon KT, Duchesneau PM, Weinstein MA. Demonstration of the superior ophthalmic vein by high resolution computed tomography. Radiology. 1977 Jul. 124(1):129-31. [Medline]. Seeger A, Kramer U, Bischof F, Schuettauf F, Ebner F, Danz S, et al. Feasibility of Noninvasive Diagnosis and Treatment Planning in a Case Series with Carotid-Cavernous Fistula using High-Resolution Time-Resolved MR-Angiography with Stochastic Trajectories (TWIST) and Extended Parallel Acquisition Technique (ePAT 6) at 3 T. Clin Neuroradiol. 2015 Sep. 25 (3):241-7. [Medline]. Rodrigues T, Willinsky R, Agid R, TerBrugge K, Krings T. Management of dural carotid cavernous fistulas: a single-centre experience. Eur Radiol. 2014 Dec. 24 (12):3051-8. [Medline]. De Renzis A, Nappini S, Consoli A, Renieri L, Limbucci N, Rosi A, et al. Balloon-assisted coiling of the cavernous sinus to treat direct carotid cavernous fistula. A single center experience of 13 consecutive patients. Interv Neuroradiol. 2013 Sep. 19 (3):344-52. [Medline]. Dandy WE, Follis RH Jr. On the pathology of carotid-cavernous aneurysms (pulsating exophthalmos). Am J Ophthalmol. 1941. 24:365-385. Debrun GM, Vinuela F, Fox AJ. Indications for treatment and classification of 132 carotid-cavernous fistulas. Neurosurgery. 1988 Feb. 22(2):285-9. [Medline]. Hamby WB. Carotid-cavernous fistula. Springfield, Ill: Charles C Thomas. 1966. Newton TH, Hoyt WF. Dural arteriovenous shunts in the region of the cavernous sinus. Neuroradiology. 1970. 1:71-81. Pan HC, Sun MH, Sheehan J, Sheu ML, Chen CC, Lee HT. Radiosurgery for dural carotid-cavernous sinus fistulas: Gamma Knife compared with XKnife radiosurgery. J Neurosurg. 2010 Dec. 113 Suppl:9-20. [Medline]. Serbinenko FA. Balloon catheterization and occlusion of major cerebral vessels. J Neurosurg. 1974 Aug. 41(2):125-45. [Medline]. Walker AE, Allegre GE. Carotid-cavernous fistulas. Surgery. 1956. 39:411-422. Panel A is an angiogram of caroticocavernous fistula showing filling of the cavernous and circular sinuses. Panel B shows a post-Guglielmi detachable coil, ie, coiling of the fistula. The red arrow points to coils within the cavernous and circular sinuses after obliteration of the fistula.